As a Colts fan since the Harbaugh days, I remember the last time the Colts had the number 1 pick. The decision then, however, was much different. Indianapolis was definitely drafting and keeping a QB, it was just a matter of who: Peyton Manning or Ryan Leaf. Bill Polian made the right choice and the Colts have benefited with one of the best sustained runs of excellence in NFL history. Peyton Manning–arguably the best QB in NFL history–has missed the season after his 2nd and 3rd neck surgeries in 2 years and will be 36 next season. Manning is due a large bonus before next season, so the Colts have a decision to make this offseason about cutting or keeping him. The Colts have the #1 pick, and this year’s draft features Andrew Luck who many consider the best QB prospect since Peyton Manning himself or John Elway. The NFL instituted a slotting system for the draft starting last year. Cam Newton, the 2011 top overall pick, made less than half of 2010 #1 pick Sam Bradford. This makes the #1 pick even more valuable. Should the Colts keep both Peyton and Luck? The quick answer: No. And here’s why. By not trading one of the two, the Colts are essentially playing short-handed. Would the Patriots trade Wes Welker and Vince Wilfork for a backup QB? Obviously not, as that player will never see the field with Tom Brady around. Besides the position argument, another reason that Peyton and Luck don’t make sense is the timing. If Peyton Manning is your quarterback, you are trying to win now and you want players that can help you do that. Conversely, if you go with Andrew Luck, you want young players that can grow with your QB and peak a couple years down the road when you’re ready to compete. Peyton Manning doesn’t help you do that and should be traded for picks and young players who do. If the Colts keep both QBs, they are facing two problems hurting the prospects of their franchise. First, the two players can’t play at the same time, meaning one of them is rotting on the bench while both are on the roster. Second, their windows don’t line up: one is ready to win now while the other will peak in a few years. Luckily for the Colts, they can correct both issues in one fell swoop. The question now is: which QB should they keep? So if you accept my argument that keeping both QBs is not the correct answer, there is still the decision about which one they should keep. Let’s take them one by one. Drafting Andrew Luck gives the Colts one of the best QB prospects of all time. Should he be successful, it is likely he will stay with the Colts for a long time. With the new rookie wage scale, his early years will not be cost-prohibitive and he would certainly be cheaper than Manning. So the Colts would get a young, talented, and cheap (at least early on) QB for the next 10-15 years. That’s pretty good. However, as highly touted as Luck is, he still comes with a healthy dose of risk. The top 10 of the draft is littered with QB busts. Even given his elevated pedigree, expecting Luck to be the next Peyton Manning or John Elway is absurd. In reality, the Colts should expect production more along the lines of Carson Palmer, Matt Hasselbeck, Matt Schaub, etc. Maybe you get Peyton Manning 2.0 and maybe you get Tim Couch, but the expected return should be somewhere in the middle. Those are good quarterbacks and nothing to scoff at, but expecting greatness is overly optimistic. On the other side is Manning. He has just a few years left–if healthy. And that’s a big if. He’s expensive as well, allowing for less money to fill out the roster around him. However, if he plays he’s an elite QB–arguably the best at his position and almost assuredly top 5. Is it enough to offset the longer career of Luck? One mistake is to say that the decision comes down to 15 years of Luck versus 4 years of Peyton. 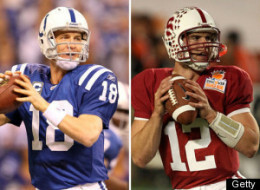 The decision really comes down to 15 years of Luck versus 4 years of Peyton and 11 years of somebody else. That QB may not be as good as Andrew Luck, but the Colts get to put somebody under center. So I’m taking Peyton Manning. Give me a few years of greatness from–in my opinion–the best quarterback in the history of the game. Restarting with Luck is enticing, and if he turns into Aaron Rodgers it will be a mistake to let him go. But the odds of that are small, while Peyton is clearly already there. 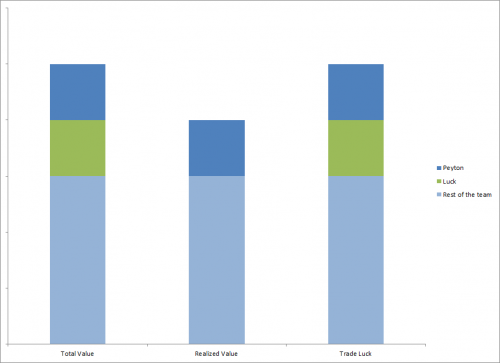 Trade Luck–who is immensely valuable to teams in need of a QB–and fill in the roster around Peyton for one more surge. If you think Luck is better than I am giving him credit for, take him and cut or trade Peyton, re-build the team around the youngster. For my money, I’m taking 4-5 years of elite QB play and hopefully a couple more shots at the Super Bowl, and I’d want to make those few shots as good as they could possibly be. Just whatever you do, please don’t handicap both quarterbacks by keeping both of them around. Interesting piece but there are two main issues I see with your reasoning. For one, your operating on an assumption that the Colts are capable of winning now with Peyton back, an assumption that I would point to as flawed. Two seasons ago the Colts were only a 10-6 team with Peyton and got bounced in the first round of the playoffs and this year they completely fell apart. Perhaps Peyton could make them into a playoff team again but I have a hard time seeing them as a realistic Super Bowl candidate considering the extent of their issues this year. 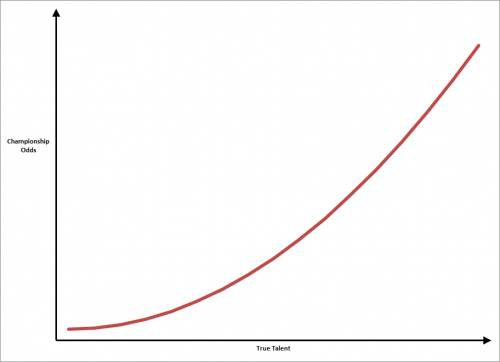 The second issue is with your assertion that, “In reality, the Colts should expect production more along the lines of Carson Palmer, Matt Hasselbeck, Matt Schaub, etc.” All quarterback prospects come with some amount of risk but in Luck’s case the risk is smaller than any quarterback prospect since Peyton (and possibly even less than his). While he has many merits as a prospect, one of the most appealing is his lack of weaknesses which is something that differentiates him from every other quarterback prospect we have seen the past decade. Even if you don’t want to expect greatness from Luck, his floor is much higher than your giving him credit for and at the very least you are getting an above average quarterback considering the state of the position in the NFL today. To your credit, you point out in your conclusion that taking Luck is the right decision for those that hold him in a higher regard than yourself. However, I believe you are also overstating the case for Peyton Manning by ignoring the fact that the Colts are not in a position to “win now”. Got to cut/trade Peyton. The risk is too high for him to get hurt again and look around the league this year with rookie qb’s (Cam, Dalton). Luck I think is arguably better than Dalton and he got his team to the playoffs in one of the toughest divisions!. Trade the pick get a big time receiver in !st round and with the trade more picks will come and you can get some more pieces. Plus after March they owe 28 Million to him and then a salary of 7 Million so they can save some cash and even pick up some free agents this off-season. As sad as it would be to see Peyton go they did him a huge favor this year by keeping him on the roster and paying him over 20 Million. So you cant feel too bad for the guy. Broncos could use him! #1/Cullen-If you don’t think the Colts can win now, even trading Luck for “win now” pieces (a reasonable position), then you definitely go with Luck. Of course, that makes it even MORE imperative that you don’t keep both. Secondly, agree and I pointed this out in the post. If you think Luck is expected to be elite then you take him as well. My main point that I wanted to get across was that you can’t keep both. There are good arguments to be made, however, for which of the two to keep. #2/Bren-Fair points. I assume you’re advocating to keep Luck but you also seem to be saying to trade the pick? Either way, you’re advocating to go young, start over, and re-build. Peyton obviously doesn’t fit in that plan and would have to go–either cut to free up money or traded to bring back young pieces to help the rebuild.